Cress [Audiobook Review] – my books. my life. I’m going to skip this in order to avoid spoilers. You can read the publisher’s description here. You all know I loved Cinder and Scarlet, right? Well, this third installment in The Lunar Chronicles did not disappoint me either. Once again, I am going to try to push a series that has lunar people and cyborgs on you. Deal with it. I don’t want to say too much, since this is the third book in a series and I could get spoilery pretty fast here. There is a lot going on this one. We add another “main” character to the mix which means we have to balance even more storylines. 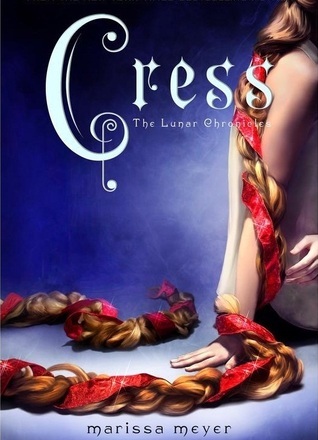 Like the title characters before her, Cress is (very) loosely based on a fairytale: Rapunzel. We’ve actually met Cress before but she takes a lead role here. One thing I didn’t like – and here I go being vague again – is that one main character was MIA for most of the book. It left me feeling a little unbalanced. But, overall, this book is fast-paced and action-packed, twisting and turning until it’s suddenly over and we’re left wanting more. If you haven’t taken my advice to try this series yet, you’re really missing out. Rebecca Soler is downright amazing in this series. I wouldn’t dream of reading it in print. hm. I was thinking of rereading book 1 because I haven’t read the rest of the series yet… and I do have audible credits… Maybe I should get the audio! Pingback: February In Review | my books. my life.